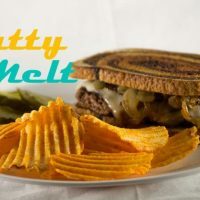 Recipe for Simple Patty Melt Burger, a ground beef patty topped with grilled onions and Swiss cheese stuffed between two butter slices of rye bread then toasted to perfection! Tasty dinners don’t get much easier than this! 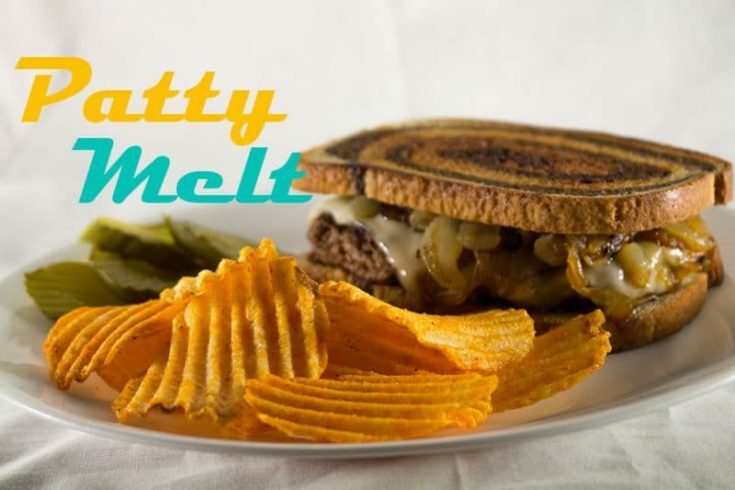 Patty melts may be an ultimate comfort food. Some nights I love just getting back to the basics in the kitchen. Simple cooking that doesn’t require too much thinking and just some beginner cooking skills to make. This patty melt, with plenty of grilled onions and melted Swiss cheese, fits that bill at my house. It’s quick enough to make that I can whip it up on a weeknight, break out some potato chips and call it a meal without feeling guilty like I do when I just serve up ham sandwiches, order pizza, or carry in soggy fried chicken. Don’t misunderstand, I also get so busy some days that dinner isn’t even on my radar until someone says they are hungry. By then, it takes every bit of energy I have left to even break out the bread, ham, and Miracle Whip. There, I said it, Miracle Whip. Yes I do use that stuff in my house!! But in my defense, I also keep mayonnaise hanging around. To me, some foods just taste better with one or the other. Toasted Rye Bread filled with beef, grilled onions and melted Swiss cheese. In a skillet, melt 1 tablespoon of butter over medium heat and add sliced onions. Cook, stirring occasionally until onions are tender, but not mushy. Use remaining softened butter, butter one side of each slice of bread and set aside. Form ground beef into 2 patties slightly larger than a bread slice. Heat skillet to medium-high heat and cook meat patties until desired doneness is reached. Set aside. Work quickly so the meat does not get cold, wipe out the skillet and place back on medium-heat. Add 2 slices of bread to skillet with buttered side down. Place a meat patty on top of each slice of bread. Top each meat patty with 2 slices of Swiss cheese. Top each with half of the onions and the last slices of bread, butter side up. Leave in skillet until bread is lightly toasted. Carefully flip sandwich and toast the other side. I prefer marbled Rye bread for appearances.